It's MFT Blog Hop Time! Well, I'm so glad you are here! I assume you are hopping along the My Favorite Things blog hop just fine, but if you've just happened upon us, be sure and start at the beginning, Kim's Blog, to take in all the new MFT goodness. This time, I thought I'd have a little fun with the Perfect Packaging jars and do something a little different with the Ghoulish Label set. This project is also a first for me in that it's actually a "hybrid" project! Yes, the paper is from the Houndstooth Digital Paper Pack. Actually, my printer is out of ink, so I found a local copy shop that let me send the downloaded file to them via email. They then printed it for me for only .38 cents a sheet for an 8.5x11! Pretty spiffy! Want to know more about how I made this? I'm the How'd They Do That Tutorial Hostess over on the My Favorite Things forum on Splitcoast. Check out my tutorial HERE!! This was so fun and easy to make and I'd love to see ya'll make one. I think there are SO MANY possibilities with the Perfect Packaging jars. I think a ladybug made almost the same way would be so cute!! The labels sets are fantastic, but remember that you can use them to make tags and cards as well. Here’s a card I did for the blog hop, too. (This post reminds me of the stores right now…Halloween stuff packed in with the Christmas stuff already out right next to it!) I used the new Santa Baby WTG set also from MFT that was so fun to color! I kept it simple and traditional here. I added the wood floor m’self and used Liquid Pearls to dress up Santa’s suit. He just better watch where he puts his hands! So stopping here puts you at about the halfway point for the blog hop, so don't stop now! Go see what Michele at Paper Cuts has in store for you to feast your eyes on HERE!! I know it will be fabuloso!! SUSIE Q-TIP: Houndstooth is harmful to the eyes. It's one of my favorite patterns, but I have to take a break from looking at it for too long! Even the copy shop guy agreed. 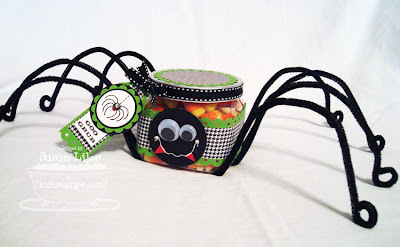 Supplies for the Spider Candy Jar project can be found HERE on my tutorial. How cute is this spider!?!? Fantastic, Susan! oh how fun is this hehe! OMGOSH!!! That is TOO CUTE!! Love your Santa Baby card too, SO CUTE!! PIMP about the naughty santa, leave it to you susie! This is fantastic! Oh how adorable! That is one spider I wouldnt mind on my counter! I also love the Santa Baby card!! Love the papers! Oh my gosh!! That Santa Baby set reminds me of Christmas growing up when my step-dad would dress up as Santa for my mom's daycare. "Nanna" (mom) would have to sit on Santa's lap first before the kids! How cool! Thanks for the memories Susie. I love the cute santa baby and OMG I love the spider idea!!!! I have to try this! wow! very cool projects. love the spider jar, BUT I LOVE the santa baby card! cute! I haven't seen the WTG set yet, but I LOVE HER!! I am the first to post a comment? How can that be?!! That card is uber-cute! I love how you coordinated all the dots from the ribbon, Dp, brads, etc. oH MY! What an adorable candy jar!! Who wouldn't LOVE getting one of the those. Love it! Love your project - SO clever! And love your card w/ the new WTG set! This is darling AND so creative. I love your new header too, so festive and fun! AAAAAAACCCCCCCKKKKKKKK!! The spider is WAAAAY too clever! Amazing!! Love your Santa Baby card, too! Love that Santa Baby stamp. I can't wait to see the full collections being released. OMGosh, that spider jar is too funny! I love it! And I love your Christmasy card! The patterns and colors are perfect. ...and I especially love your tip. I so agree! santa baby is way too cute - love the spiders for halloween too! Eeeks...this is super CUTE!!! What a creative use for this container and I love your card too. Nice job w/ the spider!!! I can see what you mean about the houndstooth! LOL! And awesome Santa card! That image is just too cute! OK! the halloween and Christmas comment cracked me up, yep, just like the stores.... but that stamp set is O! M! G! I am SOOO gettin th eWHOLE FREAKIN RELEASE!!!!! LOVE IT!!!!! that spider jar is too dang cute. And I love your paper piecing on the Santa card. Love your spider project with the houndstooth paper!! The card is adorable. The colors you used are fantastic! Nothing can be cutter than your spider candy jar creation!!!! I have to make this one.....you rock!!! love the card too. Super cute spider jar! Love the details on the card. oh WOW-i love both of these! totally adorable- the spider & the Santa card!! thanks for the fun tutorial & the amazing inspo! Definitely heading to pick up the tip! And what a sweet lap Santa card. How cute is that spider jar? Love the card too. Oh I love that spider (so cute!) and I love Santa Baby. Definitely ordering that one!! super cute spider and love the color combo on the Santa baby card. Great job! Santa baby is so in the cart. LOVE both of them Sus! Love, love, love it!!!! The spider is absolutely fabulous!!! I would've never thought to do that. The card is gorgeous! I love the paper piecing!!!! What a cute spider! Love the Santa Baby card too! The spider put a smile on my face right away! But I LOVE that Santa Baby set... that set put a smile on my hubby's face... TFS. I just LOVE that little jar, and the santa card, wonderful! Great job! Love the spider and Santa Baby card!!!!!! that spider is too darn cute, and I love the Santa card as well!! Cute spider, didn't know spiders could be cute. That spider is awesome!! So freaking cute! Wow!! I definitely want to make that spider for my daughter's teacher, it is fantastic!! Love it! Your card is great, too, you always do such fantastic work! 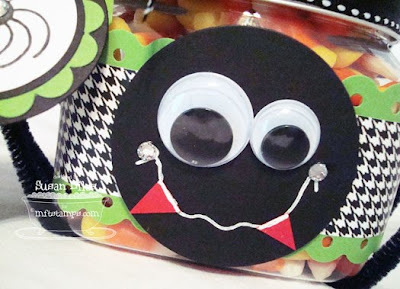 Eek!Pipe cleaners and googly eyes just scream Halloween fun!!! And love Santa Baby! How fun and naughty!!!! Great spider!! Very fun idea!! Love the card, too!! Oh my goodness!! What a fun project!! And I Adore that card! Fantastic job paper piecing! Both your project and card are great. Can't wait to see the santa set!! Oh my gosh! I love both of the projects! That spider is just darlin. What a great use for the jars and the santa card is cool too. I love your coloring and the papers look really good together. Very nice! I just love the Santa Baby set. So adorable! OH MY GOSH! How creative is THIS! I love what you did with the jar!!! SO cute!! Fab Santa card too! Fabulous! I love the Santa card! And the spider is fantastic. Oh, this is just fabulous! I love it!! What a cute little spider! The different size googlie eyes really make him adorable. very cute. and i hear ya about the christmas stuff being right next to the halloween! perfect for us cardmakers tho cause then you can switch between the projects. tfs. Ohhhhh wow, how adorable is that big ol spider! Who knew a spidey could be soooo cute! And the card is just stunning - what a terrific stamp that is going to be! :) TFS! still hopping . . .